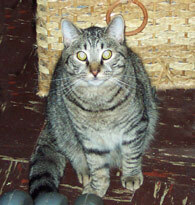 Big Samson is a gorgeous brown tabby with a rich, lustrous coat & is also known as "Handsome". 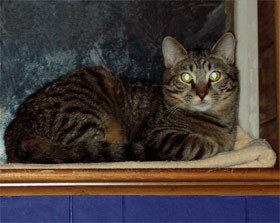 He's a bit friendlier than his sisters Flash, Zephyr, Phantom, & Bandit & mom Sheba. When he's on the window sill you can reach up & pet him & give his neck a good scritch. He'll let you hold him if you can reach up & get him down. Otherwise he mostly keeps to himself. He's got a ways to go but it's a good bet that Samson will be a Fabulous Feral Success Story someday.